This weeks Polka Doodles challenge was set by Kerry. To create a card for Valentine's Day using non traditional colours. Just a hint of traditional pink in my card! The image is pre coloured I've just coloured the table with distress ink. I've added glitter and glossy accents to the cup cakes, but it's not showing up on the photo. It's a bit fuzzy too, my first attempt using Photoshop Elements, still a lot to learn methinks! This is really beautiful Vicky - the cupcake tower is a gorgeous image and I love the scalloped edge. wow, this is card is fantastic...your style is fun, great designs...have a wonderful weekend! 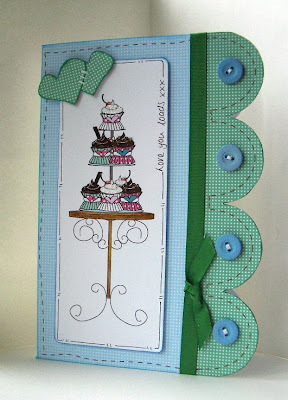 Gorgeous card Dolly! I love the colors you used and the fun shape!